As you know by now - I have been on vacation this week. 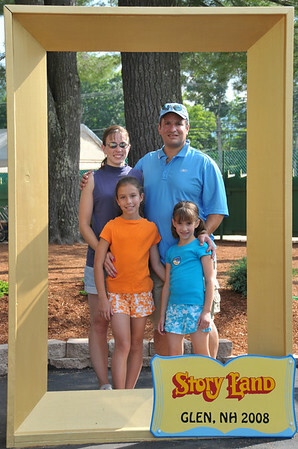 We made our annual trek to Storyland today which is up in the White Mountains right above North Conway in Glen NH. It is a great trip up since we get on the Kangamangus Highway and go right through our National Forest. I won't bore you with our time at Storyland except to say we got really wet in the morning - we got there early so the girls went on the Bamboo Chutes 11 times in a row (I went 4 ~ 6 times I think and Sue went at least 4 times with them. Katie loved it because it was the first time she really got to do most of the rides herself, you must be 48" tall to ride most rides alone. At the end of the day we took our annual Storyland postcard photo and what was unique about this was we all got into it. My mother-in-law graciously offered to take the photo and it came out really well. This is surprising since my camera is heavy and she has a tendency to move when she takes the picture. I neglected to tell her that I had put on VR - Vibration Reduction and had set the camera to high speed shutter release. She took 2 photos every time she pressed the button and they all came out excellent. Great job Mom.